Give the average quiz show host the category "The Bible" and ask them to complete the following - David and - and you'd get the same answer every time. Indeed the working title for Scott Derickson's proposed film about events from the books of Samuel even omits David's name, opting simply for Goliath. 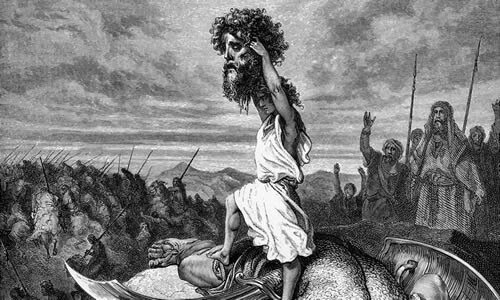 The giant everyone loves to hate does feature in Testament's David and Saul, but he's a relatively minor figure. Even David is not the film's greatest concern. 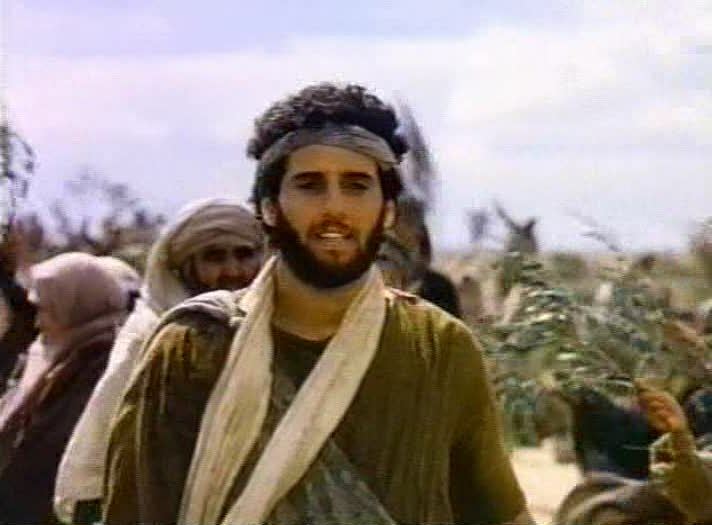 The film might even have been called Saul and David - it's Israel's first king that is the leading character in this production, rather than his more famous successor. I remember very little of David and Saul from my first viewing roughly eight years ago. It certainly didn't make much of an impression. This time around however it was quite different. Eight years on it seems like a complex and striking examination of a man fighting his demons. Whether or not "demons" should be taken literally perhaps accounts for the difference in my reactions to my two viewings of this film. Then I was open to the idea that when the Bible said demons it may, on occasion, simply be talking about something like epilepsy. Now I would tend to assume some form of health issue was what was being mentioned even if I remain open to the possibility that occasionally something supernatural might be responsible. That the film is primarily about what is going on in Saul's head is apparent from the opening scene. Instead of seeing David in the fields chasing lambs, or wistfully playing his harp in the countryside, we start with Saul raving in his throne room. The location shot tells us that it's night, and it slowly pans up a dark rocky outcrop before reaching a foreboding prison-like castle at the top. The throne room itself is also dimly lit and sinister music accompanies Saul's deep seated paranoia. At the mention of Samuel's name there's a flash back to the last meeting between the two, king and prophet. Samuel himself is a shadowy figure in this film. Dressed in a dark, hooded, robe he only appears in flashbacks, voices in Saul's head and as an ghostly apparition at the witches cave in Endor. Even Samuel's anointing of David is made highly ambiguous - David certainly doesn't realise he has been appointed king. By placing Samuel's confrontation of Saul in the midst of this scene of his madness manifesting himself, there's an implication that it is this incident which is the cause of Saul's condition, be it mental illness or spiritual affliction. It's never entirely clear which way the filmmakers understand it. Certainly the characters in the film believe it's the latter, as is consistent with their world-view but the content of the film itself - aside from the narrator's opening mention of Saul being "seized by an evil spirit" - makes a fairly strong case the other way. It's not until after this scene that David makes an appearance, killing a bear, playing for the king, being outraged by his countrymen's cowardice in the face of Goliath and then volunteering to slay the Philistine giant. But even as Goliath is hitting the floor, Saul is haunted by Samuel's voice in his head: "Another man, a better man than you...". This leads into a montage of David's victories, his adoration at the hands of the crowd and the evident love Saul's children have for him. Each moment is accompanied by Samuel's same words, "Another man, a better man than you...". One particularly enjoyable visual moment here is a pan across a stone relief depicting David's victories. David continues to play to soothe Saul's turmoil and Saul attempts to kill him. David flees and Saul hunts him down. Whilst in his pursuit Saul hears of Samuel's death, hears the prophet's voice "we shall never meet again" and decides to outlaw consulting with the dead. The next scene is of David sneaking into Saul's camp and stealing his spear. The final part of the film deals with Saul's death. His armies face the numerically superior Philistines and being unable to hear God's voice he seeks out the witch of Endor. Samuel's ghost appears - it's a highly ambiguous portrayal, Samuel's form is transparent and shrouded in green mist. The battle goes on and Saul and Jonathan die. The camera lingers on their dead bodies still upright and greyed out as if they are statues already yesterday's men being commemorated. This is the true end of the film. There is a final scene but it's an epilogue accompanied only by the narrator's voice. David is crowned in the bright sun. It's pretty much the sun has been seen in the film. The occasional scene has been shot during the day, but the majority of it is portrayed at night, and dark colours dominate the film, particularly where Saul is concerned. The visuals throughout are striking actually. It would be easy to write off David and Saul as a mere cartoon, particularly as it lacks the expressionism of other films in the series, but the animation is far superior to most hand-drawn films: a true work of art. 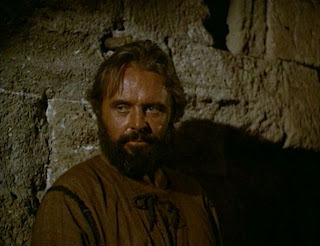 The use of colour is very strong, particularly the contrast between Saul and David, but also the evocative backgrounds, doing for this film what the scenery in so many westerns does for them. David and Saul may not be a conventional take on the film, but it's all the better for it. Instead of a typical story of the underdog, it's a complex examination of the descent into darkness - mental or spiritual - of Israel's first king, and certainly the finest exploration of Saul that I have seen. Of all the episodes of AD the final one probably contains the least biblical content and thus has the greatest concentration on imperial Rome. It opens with the conclusion to last episode's cliff hanger. Paul is taken into Roman custody to protect him from those in Jerusalem who are seeking to harm him. The film dates this towards the start of Nero's rule (played with relish by Brideshead Revisited's Anthony Andrews). This is a bit of a leap historically speaking (though possible), but it fits well the impressive way that the script is starting to pull-together the once seemingly disparate strands of plot that it started out with. One of the key links in all of this is Roman soldier Julius Valerius, who now finds himself sent to Palestine to serve as Porcius Festus's second in command. Paul is not shown appearing in front of the Sanhedrin, and the interaction with Felix is also omitted. However, Festus visits the Jewish leaders (Acts 25) and Acts' unfortunate suggestion that the high priest is a key part of the plot to murder Paul is implied here as well. The veiled hatred in this scene is contrasted with the words of Paul in the next. Whilst he remains in his cell he repeats for his friends (that have assembled there) the words from 1 Corinthians 13. It's a superbly executed speech by actor Philip Sayer. Paul appears in front of the court convened by Festus where matters are brought to a close by Paul's appeal to Caesar. We next meet him on a boat with Julius Valerius and Luke. This is the scene that I remember from my childhood (during its UK broadcast). Whilst Paul and Julius talk (pictured), Luke notes down the things that have happened / are happening. It was the first time I really thought about the fact that the gospels had authors. What I didn't appreciate at the time is that Julius who, as the programme has gone on, has gradually become more prominent, is also mentioned in this passage of Acts. Throughout AD he's been portrayed as a faithful and moderate Roman, rejecting the excesses of the empire in favour of open-mindedness and even-handed fairness. Now as he listens to Paul it's clear he's being drawn in. The film is about to underline the point that the noble qualities that Julius has displayed throughout find their home in Christianity. Acts records Julius as showing kindness to Paul. Both the memory of his name (which might otherwise be unlikely to be remembered), and his noted kindness give some support to AD's idea that Julius ultimately becomes a Christian. When they dock at Sidon Julius is baptised (this time in the sea). Strangely Paul's shipwreck is omitted, this may be for budgetary reasons (though Jon Solomon mentions that this was considered an expensive production at the time). And so Paul arrives rather suddenly and is re-united with Priscilla and Aquila. He also meets Julius's wife and a number of others. But then he is released and heads off to Spain. My limited understanding is that tradition is divided at this point with some sources saying Paul was killed under Nero and others saying he survived it to preach in Spain. It's at this point that the other part of this film I remembered (and indeed conflated with the episode above) occurs. As Paul heads off to Spain he says farewell to Luke. Luke feels that the future God is calling him to concerns "parchment, pen and ink". "I shall have to write down all that has happened. There are men and women as yet unborn who must know of the Acts of Paul." "Not just of Paul" says the man from Tarsus "but of all the apostles of the word". As Paul sails out of Italy, Peter sails in. The two men's boats cross and Peter even enquires about Paul's boat. 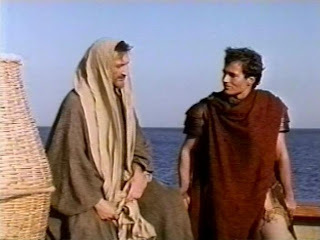 Peter immediately appoints Linus in charge of the church of Rome and whilst the film is very much done with Acts, it continues to depict much of early church tradition, namely the fire of Rome and the subsequent persecution. The fire of Rome is portrayed fairly well. Nero is planning to rebuild Rome, but the fire is very much an accident - neither he nor the Christians are responsible, though Nero blames them nevertheless. The persecution scenes in the latter part of the film are actually very disturbing. Peter is crucified upside down and Paul returns to Rome only to be executed by decapitation. 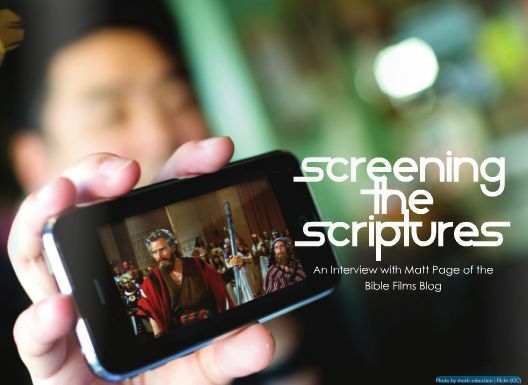 This allows the film to support both strands of the traditions about Paul. Nero himself is present for Paul's execution which seems rather unlikely. Also as Peter raised on the cross the camera gives what is meant to be a point of view shot, though it rotates on the wrong axis. But it's the scenes in the Colosseum which are particularly uncomfortable. Whilst their parents are being eaten alive by tigers and leopards we see a shot of their children playing joyfully dressed in lamb skins, seemingly unaware of the trauma they have in store. That scene is actually more disturbing by the scene of them getting ravaged by dogs moments later. The tension is heightened by Julius's daughter being amongst those sent into the arena, and for a moment is appears that she has been killed. When it's revealed that it was a similar looking girl who died instead the sense of relief, both for us and him, is somewhat slight. The result is however that the remaining heroes finally become Christians, and take on orphaned Christians as their own. They return to Jerusalem remembering the words of Aquila "soon it will be night and we will be questioned about love". The film ends with a shot of Roman soldiers taking down the scaffold from Peter's cross in the sun. Words come up on screen "The Beginning". And so it was. I've been thinking for a while about whether to do anything Bible-filmy to mark the 400th anniversary of the publication of the King James Version of the Bible seeing as there is quite a focus on promoting the Bible this year both in my own church and further afield. 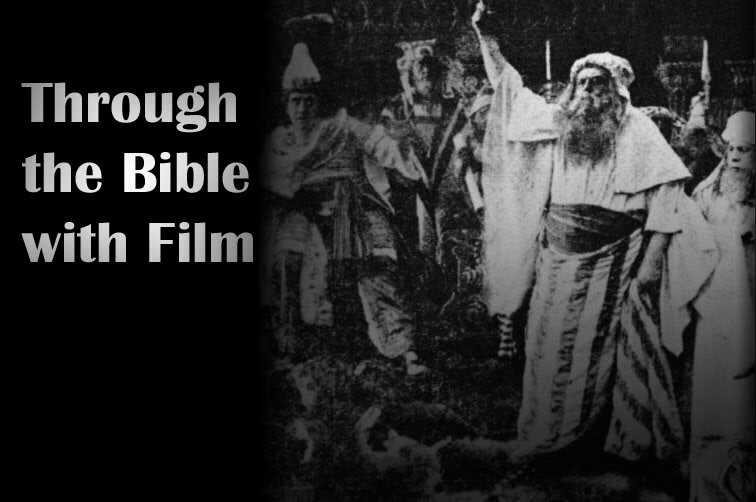 I think I'm going to host a series of film screenings working through the Bible. Ideally I'd like to get a nice mix. Rather than doing 9 biblical epics I'd like to mix styles, genres, countries of origin and so on. I'd also like them not to be too long (well under 3 hours where possible). Does anyone else want to share their ideas? Back in the autumn, Kevin C. Neece interviewed me for New Identity Magazine. I've been meaning to mention this for a while, but have been rather busy of late. The interview was included in the Winter 2010/11 issue, where it can be found on page 23. As Kevin is based in the US, we spoke on Skype, and the only slot we could get together was at about midnight my time, so part of me dreaded the interview coming out; I'm tend to ramble on and say silly things at the best of times. Thankfully Kevin's done a great job, managing to take my meandering words and make it sound like I have some level of understanding. That must have been some task, and I don't think I could have wished for better. I should also mention that Kevin's new regular column commences in the same issue on page 32. Paul has made it as far as Antioch and there he meets a Greek physician called Luke and baptises him. At the same time Paul, Barnabas and Agabus discuss the coming famine in Jerusalem and Paul and Barnabas set off to gather a collection from the various churches for those in Jerusalem. Priscilla (pictured) and Aquila leave Rome for Corinth whilst back in Jerusalem Peter is arrested by Herod. Whilst in prison he hears of James's execution prompting him to pray for his life. The scene showing his escape is quite effective. There's no angel, all we see is a bright light shining through the window in the middle of the night. But as he looks out through his open cell door he can see the streets of his city where previously there were only the walls of the prison. The somewhat comical scene of him being left locked outside the prayer meeting petitioning for his release is omitted however. We hear of Peter's escape as Herod is told. There's a brief reaction and then a cut to the next scene where we are introduced to Linus, a recent convert, destined to the the second pope. with Paul seemingly absent - he's shown in Corinth preaching and there meets Aquila for the first time. Aquila is a great character in this production in part due to Tony Vogel's warm portrayal, and partly due to the way that the script expands the references to Priscilla and Aquila's generosity and hospitality to make these central parts of their characters. That said it's very much Aquila who is to the fore here, which seems to contrast with the picture we get from the New Testament where, very unusually, Priscilla is names first on four of the six occasions their names appear together. 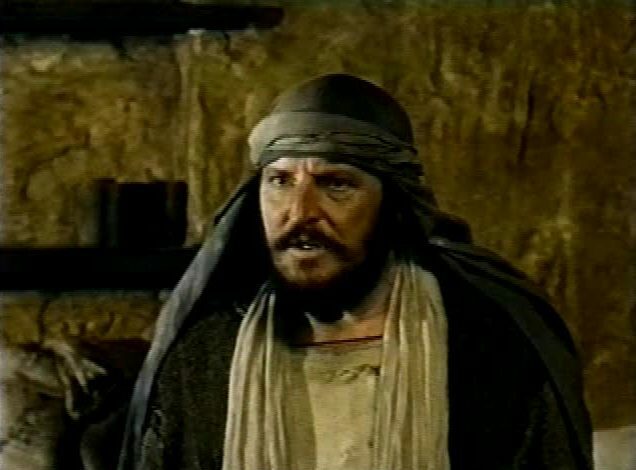 Vogel is something of a Bible film regular also starring in The Day Christ Died, Jesus (1999) and Jesus of Nazareth, not to mention his appearance in Raiders of the Lost Ark. The three eat together and there's a passing reference to Paul's reception in Lystra and Philippi. It's somewhat surprising that the latter isn't shown. It's one of the more famous stories from the middle of Acts, and most other films about Acts show it. We're also not shown Paul's split from Barnabas which happens in between these other two incidents. The second half of this episode is rather light on New Testament content, we see Paul preaching in an unnamed synagogue deftly summing up some of the places he has visited, and there's a scene of Priscilla and Aquila talking to three of the fictional characters in the story about how conversion can be quick or "a lingering slow sweet skill". Saul may have been converted at the end of the last episode, but word has been a little slow getting around the Christian community, and even those who have heard are understandably sceptical. Leading the charge for the doubters is, of course, Thomas, who continues to be rather short in the joy department. In the meantime fear of Saul has driven the church further afield. The opening scene in episode three finds Peter (pictured) in Samaria, exorcising a man and scolding Simon the magician. The idea then comes to Peter that going around in threes isn't as effective as it might be, and so whilst Peter returns to Jerusalem, Philip is sent off to Gaza encountering the Ethiopian offical en route. Things are slightly different from Acts - the Ethiopian's chariot (a carriage really) overtakes Philip on the way. The scene is quite effective though and it's quite an interesting depiction of members of the early church coining fulfilment interpretation off the cuff. The baptism scene - shot from below - is one of the best so far, and it's the first time the emotional theme in the soundtrack fits rather than cheapening the moment. Meanwhile Paul sees his companion on the road to Damascus killed by zealots and heads to Jerusalem to try and convince Peter and the others that he has been converted and to gain some instructions. There's plenty going on in the Roman side of things. Caligula is continuing to be as mad a March, April and May hare, and the Jewish brother (Caleb) and sister (Sarah) are starting to fall in love with Romans. Caleb is falling for a Roman gladiator which doesn't really ring true, but it does bring some much needed sexual tension. Sarah is smitten by a prominent centurion who conveniently finds himself with access to Caligula, Claudius, Priscilla, Aquila and later on Paul. His experience watching Caligula order his army to collect shells on a French beach rather than invading Britain drives him to plot his emperor's assassination and it's not long until he and others carry out their plan and crown Claudius. Peter then appears in Jaffa, and is called on to bring Tabitha back from the dead. There's a great scene of him and Thomas trying to remember what Jesus did in this kind of situation, and it's nice to see Thomas being the faith filled one rather than Peter. It all brings a nice angle to these events capturing the humanity of Peter which often seems absent in Acts. We also see him struggling with the fame that comes with his ministry. The film's low budget (big name actors aside) is occasionally apparent, and it's here that it's most notable. We first meet Cornellius at the start of the episode in a sea side villa that looks suspiciously like the one in Capri Tiberius had retired to. Similarly Peter's vision is not shown, only his experience of it. Cornellius is converted and is baptised in a dirty looking rock pool by the lusciously blue sea. Sarah's love (Julius Vallerius) is trying to buy her out of slavery and in so doing goes to Priscilla and Aquila for help (they have already helped him locate her). Aquila and Priscilla are two of the best characters in this production. Since not a lot is known about them from the New Testament, the scriptwriters have pretty much free reign in terms of how to use them and how to develop their characters, but there;s just enough in the pages of scripture to make their characters interesting. Not only is it through them that we see things such as the purge of the Jews from Rome, we also get to see them grow from a couple not really sure if they are Christians to people leading others to faith. Peter's experiences in Joppa lead to another meeting of the church in Jerusalem where they try to come to a consensus on admission into the church and the relationship between them and mainstream Judaism. In the background here is Caligula's attempt to install a statue of himself of the Jewish temple. But the very next scene shows Caligula's assassination and the episode ends with the statue, which was still outside the temple, being toppled and destroyed in celebration of the news. Watching it today I couldn't help but think of a similar statue meeting a similar fate not to far away in Iraq. The fact that it's purely coincidental (unless this series was big in Iraq) is a useful reminder not to read too much into similar looking images. Having taught on Matthew, Mark and Luke in the autumn, I've been mulling over various issues related to the synoptic problem. One thing that I've been thinking about in particular is the ideological convenience of Q (the hypothesised sayings gospel which the majority of scholars believe was the source for the material shared only by Matthew and Luke). Precise applications of the Q theory vary widely, but generally speaking it's held to be earlier than (or at the latest contemporary with) Mark, and having its roots in the first recollections of Jesus' words by those that followed him during his ministry. Whilst New Testament studies is a broad field, there are nonetheless two major camps, though there is considerable divergence within each. On one side we have what we'll call the conservatives. Broadly speaking they hold to the position that the gospels are, if not actually infallible, an historically accurate representation of what occurred in the life of Jesus. On the other hand we have the liberals who reject this position, believing that the best way to access Jesus and his teaching is by historical reconstruction using the gospels as key sources. Now I should be clear that I am not claiming that those who believe in Q do so purely because it suits their ideological beliefs. Nevertheless, it is interesting that Q theory does suit both groups rather well. For this latter group the presumed antecedence of Q suggests that it is also more historically reliable. As a result the ethical teacher Jesus we would find were a copy of Q ever to be discovered is a supposedly more likely reconstruction than Mark's apocalyptic exorcist and miracle worker. In a context where exorcism and apocalypticism seem 'a bit weird' but the power of words is greatly appreciated, it's not hard to see the appeal of the Q theory. Conversely were the Farrer-Goulder-Goodacre theory to be correct (i.e. that Matthew used Mark and then Luke used both Matthew and Mark) then this would suggest that the miracle working Jesus we find in Mark is the most historically probable, and that there's an increased chance that the ethical teacher is the invention of the early church. For the conservatives the appeal is slightly more straightforward. Agreement with Q theory not only gives them a degree of academic credibility - they agree with the scholarly consensus on this crucial issue - but it also bolsters the reliability of the later gospels. The gap in time may remain the same but Q acts as a crucial stepping stone providing reassurance that the Jesus of the gospels really does correspond to Jesus as he actually was. As I said above, the convenience of the Q theory isn't necessarily the reason why any given scholar believes in the theory. It does mean however that Farrar theorists (and other Q-sceptics) have their work cut out in overturning such a sizeable majority. Edit: In the comments, Mark Goodacre mentioned something that I meant to say when I originally posted this. 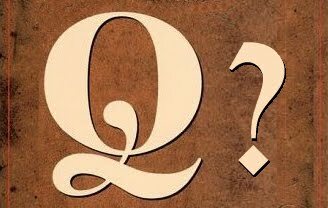 It stands to reason, of course, that those who reject Q may also be doing so for ideological reasons, myself, no doubt, included. In terms of the events depicted episode 2 of A.D. is probably the most momentous. In Roman terms there is the death of Tiberius (at the hand of Caligula according to AD as with Tacitus), and Caligula's sucession. In Biblical terms we have the conversion of Saul, doubtless the most significant event in Christian terms since the resurrection. Before all that however we start with Peter and John and all the other apostles up in front of the Sanhedrin as a result of what they said after healing the man at the temple. 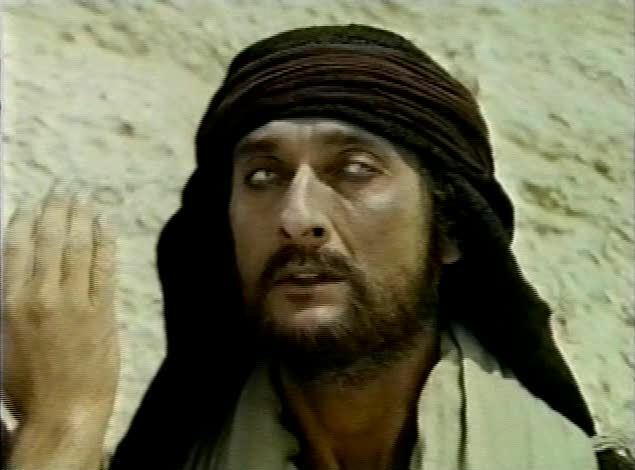 Most of the Sanhedrin are livid and wanting to persecute but Gamaliel (who is usually the tolerant, if Christo-sceptical, member of the council) making his famous argument that they should be left alone. Gamaliel also adds (here and elsewhere) that he is impressed with their deeds such as helping the poor. Others however are less impressed. The Hellenistic Jews are shown complaining that they are being neglected by the disciples in favour of the Jerusalem Jews. This leads Stephen and Philip to go to Peter suggesting something be done. Peter names Stephen and Philip as two of the seven deacons and leaves Philip to choose the rest. He does rather more than that however, also talking about a mission to the Greeks. Peter is seemingly against this. Whilst he tries to laugh this off with a joke about having already spent too much time on boats, the film does a good job of highlighting both the rift between the Hellenistic Jews and those from Jerusalem and the shortfall in Peter's thinking. Stephen takes his commissioning as carte blanche to preach as he likes, and even Saul has to admit he is incredibly good at it. In fact he's so good that many are following him and he is beginning to be seen as a real threat to mainline Judaism. Saul, despite earlier having been Stephen's friend, reports him to the Sanhedrin. Stephen is pulled up in front of them, and much of his sermon from Acts 8 is reproduced here. It doesn't go down well and Stephen is imprisoned and later stoned (without giving a sermon). The filmmakers add some fake tension into this scene by showing Gamaliel rushing to the execution to try and spare Stephen's life - this is not an official execution, the mob has broken into Stephen prison and dragged him off - but to no avail. This incident and Saul's sudden turn to zealotry is a bit of a worry for the Sanhedrin. Concerned with stirring up trouble in Jerusalem they commission him to go to Damascus where it's thought his mission will cause less problems with the Romans. Saul is on his horse with only one other companion. 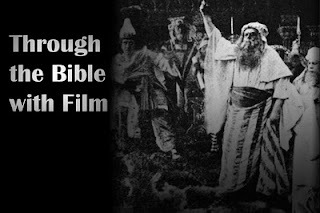 There are some rather poor special effects here (copied in the Bible Collection film on this story) and we hear no voice. Paul is led to Damascus, is restored by a seemingly unafraid Ananias and tells his companion that his mission is over he has become a Nazarene. Meanwhile Caligula gets straight on with being insane, and also seems to be having some kind of homosexual relationship with Herod Agrippa, whilst the budding Roman - Jewish relationship has moved onto Rome. I've been trying to get a copy of the full version of 1985's AD for four or five years now and having finally got hold of it I'm going to share a few notes as I go. I'll post some details about the DVD a bit later, but for now I want to focus on episode 1 and in particular the parts concerning the trials and triumph of the early church. The series actually begins before the start of The Acts of the Apostles" with a story from Luke's first volume, the Road to Emmaus (Luke 24). Cleopas and his companion are quickly joined by Jesus as they hide behind a tree from some Romans. Jesus is rather annoying. He's quite smug and speaks in an Eddie Izzard-esque "Hello, we are the Romans" voice. The incident is shown at some length across several scenes and leading in to Doubting Thomas confession. Thomas's portrayal is even more extreme than it is in most such films. Not only is he a sceptic, but he's also very grumpy. Interestingly though there's no ascension scene. Thomas's confession is followed by Jesus' promise of Matt 28:20, and a final dose of bread and wine. The camera pans round the disciples who are sat in a circle but when it returns to Jesus' spot, he has disappeared. At first it appears that he has simply disappeared in a similar manner to his arrival. However he's never seen again, and the next scene involving the disciples is the day of Pentecost. Before then however we get a very nicely done introduction to Gamaliel and New Testament ers Judaism. Gamaliel is holding some kind of discussion with a number of men representing a good swathe of Jewish sects from the period. Present is Paul who is somewhat likeable if detached from the others, and Stephen who is yet to be converted but is still well on the way. A zealot contingent is also present. It's obvious from this episode alone that this production is at pains to provide a sold context for its story. Scenes like this and little details here and there do well at educating without being teachy. The portrayal of Pentecost isn't very satisfactory. There's a build up with a mysterious blowing wind (despite all being calm outside) and then some kind of orange lighting effect whilst the disciples dance around. The accompanying music is terrible too so it's all rather disappointing. This is followed by some kind of spontaneous procession into the temple (replete with people waving palm branches) and Peter delivers his sermon. He gets another chance to preach to a crowd in the final incident from the Bible in this first part. Peter and John appear in the temple and heal the man there. Peter gets to speak, as watched by some of the high priests and Paul who does definitely not approve. The final glance we see of characters from the Bible is Stephen (pictured) converting and being baptised in the river. In many ways this episode is as much about Stephen as it is about Peter or Paul. The majority of the programme follows a paranoid Tiberius at Capri and a bunch of zealots trying to free one of their number from Roman arrest. Stephen is not a zealot but is determined to free the man (Caleb) as the two were wrestling prior to Caleb's arrest. But having introduced us to Saul/Paul the porgramme has been set-up nicely to learn more about Paul and his conversion in part 2. Both the Hollywood Reporter and deadline.com have the story that director Scott Derrickson (The Exorcism of Emily Rose) is to make Goliath, about the death of the Biblical giant. Ryan Kavanaugh of Relativity Media is teaming up with Wyck Godfrey and Marty Bowen of Temple Hill to produce the film. 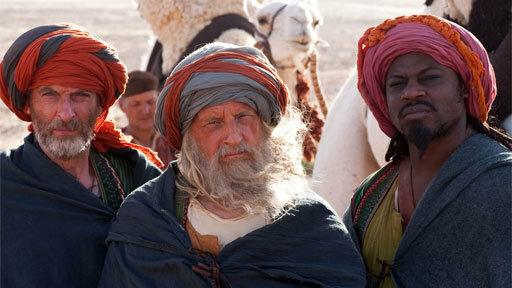 Godfrey and Bowen previously worked together on the 2006 telling of The Nativity Story. The script has been written by John D. Payne and Patrick McKay. The Hollywood Reporter article says that the new film will be aiming to have "a modern vibe that harkens to the spirit of films such as 300 and The Bourne Identity. That makes it the second such film in production to aspire to be like the 2007 comic book-esque epic, the other being Fox's Moses movie. When the fierce warrior Goliath is sent to track down the foretold king of the Israelites, the young shepherd David gets thrust into an epic chase and adventure fighting for his own life, and his loved ones, in a battle between the young man and the giant. That sounds a little different from the biblical account, so it will be interesting to see how this ends up. I'm also interested to see what the film does with the fact that the more reliable Hebrew Bible manuscripts describe Goliath as about 6'6" rather than the more famous 9'6". I can't imagine, particularly given the citation of 300 above, that this is something the film will be looking to incorporate (although it would make casting a lot easier). Not only would it upset some Christians, but it will also be derided by those outside of the church, particularly those whose knowledge about Goliath only extends to knowing that he was a giant. That said, some kind of nod in that direction would be fun. Over the next few weeks there will be a number of posts on films based on Acts, mainly the two 80s TV programmes, A.D. (1985) and Peter and Paul (1981). I've now seen the first episode of the former, but writing up my thoughts on that will have to wait until I have a bit more time. So for now I thought I'd edit and post a few thoughts I wrote back in December 2004. Please be warned this is not he best, or most well informed, writing I have ever produced! Watching Peter and Paul is rather like reading the book of Acts. Obviously that's the intention - although the film is much more than a simple reproduction of Luke's second great work - but it also reflects the way Acts starts off well, but peters out towards the end (pun most definitely intended). Hopkins is, as you'd expect, great value and he produces a really good mix of Paul the hothead that comes through so clearly from his writings. At the same time he avoids playing Paul as the kind of vitriolic bigot that he's so often caricatured as today. This view always seems a bit out of context, and casts him as someone who would be unlikely to achieve what he did. Hopkins does this better than any of the other actors I've seen play Paul, although surprisingly he delivers Paul's most vitriolic line ("why don't they just go and castrate themselves?") coolly and calmly, as if he's talking about removing a slightly annoying toenail clipping. What I liked most about the programme was the way the script made constant biblical references like little extracts from the prophets, Psalms or now-familiar Pauline Hebrew Bible was pretty staggering when we consider that for him it wasn't all in one convenient little volume, he didn't have a concordance, and he didn't have the luxury of being able to leave a gap and cut and paste the quote in later. He seems pretty steeped in the Old Testament - I imagine he would have had to have memorised large parts of it to be able to pull out all the passing references and connotations he does - and the film portrays this rather well. Paul is also shown referring to Jesus' teaching and here I was less convinced, particularly as he doesn't really do this much in his letters. We know he was familiar with bits of it, but he doesn't seem to use it that often and I'm not sure he would have known bits verbatim in their canonical form as the film suggests, particularly as some of those bits probably hadn't found this form when Paul was writing. But it is interesting how that as Paul goes on he uses Jesus' words less and less and starts to use his own words more. Perhaps this is suggesting that Paul's teaching started to drift from the message of Jesus, but it could simply mean that as Paul went on he had more and more confidence in his own material. There are however a few moments in the second half, which particularly focus on Paul, which let things down. Dramatically the shipwreck in Acts 27 is potentially an exciting scene, but all we get is reference to a storm that is coming followed by a cut to a scene of the shipmates arriving on the beach clinging on to bits of driftwood. Likewise, the legal drama is left to the scene with Festus and Agrippa. I do find this a bit tedious in Acts, but I couldn't help wondering how much better these scenes might have been is they had been made by someone with good experienced of making legal dramas. That said, the real let down is the depiction of Peter. Early on he seems to have decided he couldn't lead people despite a great Pentecost preach and called James in to do it for him. Peter then feels unhappy about the situation but tends to moan about it rather than getting on with the business in hand. He and Paul get on well and he seems to inspire Paul at the start but then doesn't speak to him for 8 years, and then there is the Council of Jerusalem and the clash of Galatians 2, and they never speak again. After this Peter wanders around going to Babylon (rather bizarrely) and eventually re-tracing Paul's steps, and only returning to real, on-the-edge, preaching once Paul dies. By this time it's only a matter of weeks before he'll die too, and it just seems like a dithering old man desperately trying one last attempt to make something of himself. This is wrong for a number of reasons. Firstly Peter is played into a weak role. It's not Robert Foxworth's fault he can't match Hopkins, but the script for Peter is poor too. Key Petrine moments are erased completely - notably Peter's last main solo narrative with his vision and Cornellius. 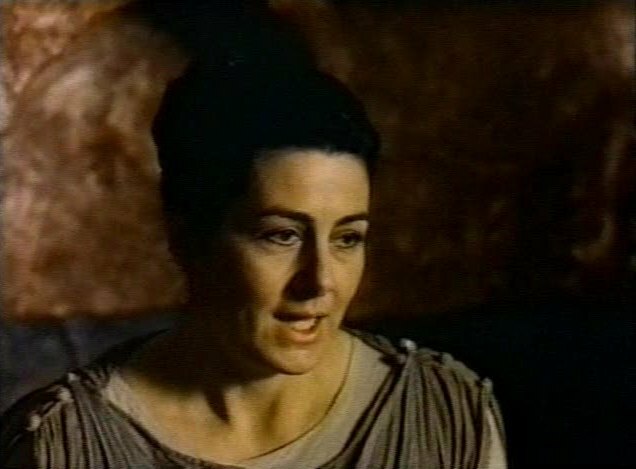 But later on we delve into fiction (or perhaps its less well known legend with the closing scenes) whilst ignoring more popular "legends" such as the Quo Vadis moment. Fatally ending on the weak Peter, means that the film ends really badly. Once Paul goes, so does any resemblance of interest. A number of people have commented (both on this site and, in particular, at the end of my rejesus review) about the way that BBC1's recent The Nativity showed the magi arriving at the stable very shortly after the birth and the appearance of the shepherds. Whilst this is the most popular view (taking the nation as a whole) the majority of these comments considered this depiction to be incorrect. So seeing as today is the day traditionally associated with the arrival of the magi, I thought it would be a good time to tackle this particular question. To start with I want to define three possible interpretations, and, despite what some might say, they are definitely interpretations. What I'll call the popular view is the one that the average person on the street might describe, particularly (though certainly not exclusively) if they were not given the time to look at the texts or think it through. Essentially this pictures the shepherds and the magi arriving in the stable in the same evening - the night Jesus was born. The traditional church view (which is something of a simplification) is that the shepherds arrived on Christmas evening, but that the magi didn't make it until Epiphany twelve days later. The modern church view (and again this is just a name, though I deliberately use "modern" rather than "contemporary") is that Luke's shepherds arrived at the stable on the night of Jesus' birth but then Mary and Joseph stayed on in Jerusalem for a while. Eventually, when the census had passed and the inns had cleared a bit, they moved into a house and were visited by the magi some time (perhaps up to two years) later. Those have objected to Jordan's portrayal of the popular view have, it seems, tended to come from either the traditional church view, but, in the main from the modern church view. Indeed this was a view I first heard when I was a child and it wasn't until 2001 when I heard any serious alternative interpretation. It does make good sense. Luke's shepherds clearly visit on the night of the birth ("this day" v11, "with haste" v16) and, to modern eyes at least, there does seem to have been a change of scene by the time the magi arrive. Whether this change occurs within 12 days, or 2 years is seemingly less critical so the two church views are actually fairly closely linked. 1 - Matthew (in English translations) uses "house" whereas Luke (again, in English translations) says there was "no room in the inn" and that the baby was laid "in a manger". 2 - Herod orders the deaths of not just the newborn babies, but also all infants two and under. This suggests either that there was some doubt in Herod's mind as to Jesus' precise age, or that the events were happening some time later (say one year) and Herod wanted to be certain that the child wouldn't escape simply because his soldiers couldn't tell the difference between a one year old and a two year old. 3 - The use of "child" in Matt 2:10 opposed to Luke's "baby" (2:16). (There are potentially other supporting evidence such as the appearance of the star and travelling time, time consorting with Herod and so on, but these, even in the English translations, don't really present any difficulty to one side or give much support to the other). In my opinion none of these create too much a problem. I'll take them in reverse order. 3 - Even in English the meaning of the word "baby" is a subset of the potential meanings for the word "child". Indeed Luke himself, in verse 17, switches to using "child" (paidiou). 2 - It doesn't take much to see that the logic of this point suggests that a cautious/paranoid Herod might command death to the twos and under even if he knew that Jesus was much younger. How big a margin of error would a paranoid, violent king want to ensure the threat to his power was removed? 1 - So this is really where the weight behind the interpretations lies, but, as is often the case, it comes down to our understanding of the culture and the Greek words used. And here we start to see both the popular view of the birth in the stable with everyone arriving together, and the two church views converge. The first point is that neither gospel writer mentions a stable. You can see that even in the English. Secondly the word translated "inn" (katalyma) covers a range of meanings. In the NT it occurs three times here and in Mark and Luke's accounts of the Last Supper (Mark 14:14 and Luke 22:11) all of which could be translated "inn", but in the latter two cases it's usually translated "guest room". Outside the New Testament it is more usual to find it translated "guest room", and conversely when Luke wants to talk about what we would call an inn, in the Parable of the Good Samaritan, he uses an other word entirely. Thirdly, these varying translations of the Greek are bolstered by what we know about houses in those days and in that place. Rather than our prim and proper houses with neat, tidy and clean living rooms, things in first century Palestine were rather different. The houses often used to have two areas, an area where the animals lived, and an area where the humans slept. The advantage of this was that not only did you give your animals somewhere safer and warmer to sleep, but they also gave a bit of heat to your house in the middle of the night. It's not hard to draw up a scenario, then, which joins all this together. Mary went with Joseph to his home town. As it was Joseph's ancestral home it's likely that they would be expecting to stay in their relatives house, as would generally be the case today. But when they arrive they find that the guest room is already taken (perhaps with other relatives harbouring the same idea) and so they bed down with the animals. This would be far more normal to them than it is to us today, after all they let their farm-type animals sleep in their houses. It's the modern equivalent of going to see some relatives and sleeping on the sofa bed in the lounge. In the middle of all this the baby came. Of course whilst that means that the BBC don't necessarily lose points for having everyone arrive together, you could argue that they lose them instead for resorting to having the birth in the stable as per tradition, particularly as their 2001 documentary Son of God made this precise point. I think that would be churlish though, apart from the fact that it would probably alienate much of the general public, the film gives a massive nod in this direction by having Joseph go first to his relatives only to be rejected because of his pregnant not-yet wife. So whilst I'm hoping that one day there will be a film which shows the scenario I've described above I don't think this was the project to do it, and the way that they did it broke new ground in a way that will make it easier for future versions of the nativity story to build upon. All this does of course raises the question of whether this was what actually happened, or merely what Matthew and/or Luke had in mind when they wrote/edited it, but that would be another long post in itself. Lastly, Sacrificium Laudis gives a more detailed and more informed perspective on what I've written above. Feel free to suggest any other relevant links in the comments. Joseph Kelly has posted a massive Biblical Studies Carnival for December 2010. It contains a link to one key post on The Nativity, which I had missed - an article by Helen Bond who acted as historical consultant for the programme.